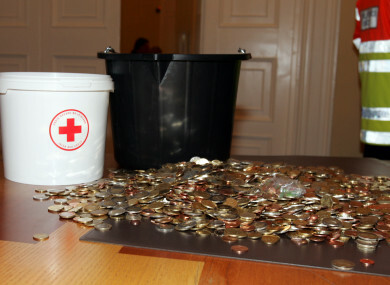 Money donated by the public to the Irish Red Cross. THE IRISH RED Cross has had to let go of staff and restructure the charity after a drop in donations contributed to financial pressure. It has also recently lost a board member and has pulled out from one of its long-term projects in Niger. Speaking to TheJournal.ie this week, the Irish Red Cross’s General Secretary Liam O’Dwyer outlined the serious steps the charity – which receives government funding – has been taking in order to deal with the financial pressure. One of the key issues is funding. By the mid-year point in 2017, it had taken in €1.1m but over the same period this year it has taken in €800k. That’s a 27% drop in public donations. The restructuring has led to the loss of three core support staff in head office so far this year, while four vacant positions are not being filled. Two of these positions became vacant earlier in the year and two became vacant in the last two weeks. Within the organisation, five staff have been redeployed. The International department has also been subsumed into the department of the Secretary General, and Irish Red Cross international work will continue with the retention of an experienced international staff member. In addition, a board member stepped down in 2018. O’Dwyer would not name them, but said that a new board would have been coming into place later this year anyway. “We have had some challenges, and I suppose the first one is matching the income and the expenditure and that’s what we’re doing, and that’s why we’ve had a look at the resources we have here and the financial resources. We have to match the two together and that’s why the restructuring itself took place,” O’Dwyer told TheJournal.ie this week. He said that the financial pressure that the charity is under is due in part to rising costs due to regulation and governance – which he welcomed – alongside the big drop in fundraising donations. He said that though the charity welcomes regulation, it is costly to implement, alongside data protection, GDPR, meeting safeguarding standards, the governance code, and accounting standards. The charity meets all these standards, he said. He said that the national first aid operation is also costly. The drop in funding this year is mainly in the international sphere. O’Dwyer said that the Irish Charities Engagement Monitor said in a recent survey that trust in charities has dropped by six percentage points this year. It said that overseas aid and development is the sector with the second lowest level of respondents saying they trust the sector ‘a great deal’. This comes following scandals involving charities like Oxfam. O’Dwyer said that when there is a major emergency “the Irish public donate extremely, extremely well and they respond very well”, but donations would have been affected by the fact there hasn’t been a major international emergency to donate to since 2015. All of this has forced the Irish Red Cross to make some serious changes. “I think what we’re doing is we’re focusing on setting priorities and focusing on the priorities of the organisation,” said O’Dwyer. “And we have to just produce a leaner organisation.” He said there is a responsibility on the Irish Red Cross “to match income and expenditure which is what we are doing”. He said there are significant needs they want to meet, in terms of training, service provision, migration, working with refugees, the work the charity does in prisons, and non-violence campaigns. The international section of the Irish Red Cross has now been subsumed into the section that reports directly to the Secretary General. It is understood that a senior member of staff in that section has been let go, but O’Dwyer said an experienced person from this section has been retained. Asked about the impact of this on the charity, O’Dwyer said that international work is still a priority for the Irish Red Cross. It has projects in Indonesia, Nepal and India for example. However Irish Red Cross cancelled a planned trip to Nepal this year, which O’Dwyer said will be rescheduled. It also recently ended a 10-year project it had been running in Niger. O’Dwyer said this decision came after the Irish Red Cross was told that its Irish Aid funding for this project wouldn’t be continued. “These decisions are always difficult decisions but also we were there for 10 years,” said O’Dwyer, noting that the Belgian and Niger Red Cross are taking over full running of the project. O’Dwyer said that he expects the Irish Red Cross to be in a “better place” by October of this year, thanks to its restructuring. This is not the first time that the Irish Red Cross has experienced issues. In 1999, staff called for an independent inquiry into the management of the society. The Irish Times reported at the time that the staff spoke of an “unprofessional atmosphere”. The year previously, its then-Secretary General Martin Good resigned following internal disagreements. In 2011, the Oireachtas Public Accounts Committee looked at the issue of financial control at the Irish Red Cross. The Irish Red Cross said at the time that no new findings had come to light, and that it had implemented the recommendations that had been made. A report published by the PAC in 2012 had a number of recommendations such as undertaking regular audits of all its branches; and ensuring that a structured feedback process is in place to verify the implementation of the change programme being pursued by the charity at the time. In 2015, three senior managers resigned from the Irish Red Cross. At the time, Dóchas – the umbrella group for aid agencies – expressed its concern to the Irish Times about it. There were concerns at the time over finances and management. O’Dwyer took up the role of Secretary General in 2015 as the charity focused on moving on from those issues. How have things been going at the Irish Red Cross since then? He said that the charity wanted to give confidence to funders, the government, the public and its own members and volunteers. The restructuring of this very diverse organisation is being carried out in conjunction with the development of a new Irish Red Cross three-year strategy, the intention being to create a more cost-effective organisation to support its members. The Irish Red Cross’s annual report will be published in late autumn. The annual report is based on a consolidated audit of the 94 branches of the Irish Red Cross and the 28 area committees as well as the head office operation. In 2017, over 250,000 volunteer hours were provided by the Irish Red Cross members supporting local community events. It also carried out significant work to provide emergency support during storms Ophelia, Brian and Eleanor. Email “'None of these are easy decisions': 27% donations drop leads to job losses at Irish Red Cross”. Feedback on “'None of these are easy decisions': 27% donations drop leads to job losses at Irish Red Cross”.